2013 has seen a move away from the rich velvets, deep colours and plush textures of the ‘Downton Abbey’ inspired vintage influence, to a more fun interpretation and an eclectic take on vintage styling. There have also been some popular choices this year, with many clients looking for the same theme to their party – but each deserving a unique interpretation. We have, for example, created three bespoke versions of Alice in Wonderland! LAS VEGAS – With the likes of Coronation Street’s Catherine Tyldsley choosing the glitter capital of the world as the inspiration for their parties, we see this old-time favourite climb to the top of the style rankings this year. The interpretation now is less Elvis and more hip club and casino scene, with great food (thanks to the likes of Wolfang Puck & Gordon Ramsey taking over Vegas) and fabulous cocktails….and just a touch of the show-girl for fun. ALICE IN WONDERLAND – Yes, this classic novel and film is back with a vengeance. Both the moody, darker interpretations of the recent films and the light, colourful earlier versions are popular. With vintage items still easy to find in retail stores, you can create the bright, fun and eclectic style look quite simply. Take a look at this magical tea pot from John Lewis. Just fill with bright flowers, butterflies and foliage: JOHN LEWIS TEAPOT. Or this one from Cath Kidston: MUSHROOM TEAPOT. Use some quirky candelabra, such as this BLUE BIRDIE Candelabra to add some height and fun to the tables. CLUB NIGHT – Increasingly, we are asked to recreate amazing London or New York clubs. Using the hottest DJs, creating chill-out rooms and energising parties with incredible lighting, we build a brand new nightclub inside an existing venue (complete with soundproofing the walls in some cases). Take a plain backdrop and add dramatic lighting. There are a few great style items you can also use to get ‘the look’ such as a range of fabulous illuminated ice buckets for your Champagne: ICE. A dance floor is essential, and again you can add an illuminated or coloured floor for drama. A glitter ball is traditional, of course, but also consider an over-sided hanging chandelier which can be seen in many of the more upscale clubs. Take a look at the images at: PRIVATE PARTIES for ideas and inspiration. The key of course, is the very best music! Spend to get the best – it will be worth it. Still Need Office Christmas Party Ideas? –COOK YOU OWN – create a culinary competition within your office by splitting into teams. Under the guidance of a professional, or even a celebrity chef, cook your own 3 course festive meal. Eat, enjoy and then hit the dance floor! –PUB CHALLENGE – hire a room in a local pub and then fire the team spirit with some traditional pub games. Bar skittles, hoola, giant snakes & ladders and hoopla to name but a few. Follow with traditional pub food and plenty of beer. Christmas party ideas don’t have to be lavish in scale to be huge in the fun stakes! –LAS VEGAS CASINO – very on trend with lots of celebs choosing Las Vegas as a style for their parties this year. Also ideal for larger businesses who can hire a function room and create their own Vegas casino with roulette and blackjack tables. Bring a touch of the ‘Las Vegas’ atmosphere to the UK. Glamorous showgirls, a ‘club’ room with fantastic DJs and maybe even an Elvis or two! Gamble for prizes and not money. Serve chic cocktails and make this a black-tie affair, to create a really glamorous night. Some casinos also have rooms that you can hire for just this type of event, so worth checking this out. –GO TO THE BEACH – yes, Christmas party ideas for the luxury event and those with a larger budget. Fly your team off to the beach for a Caribbean style BBQ on the edge of the surf. –DINE IN THE DUNGEON – create a spooky night in the dungeons of a castle. 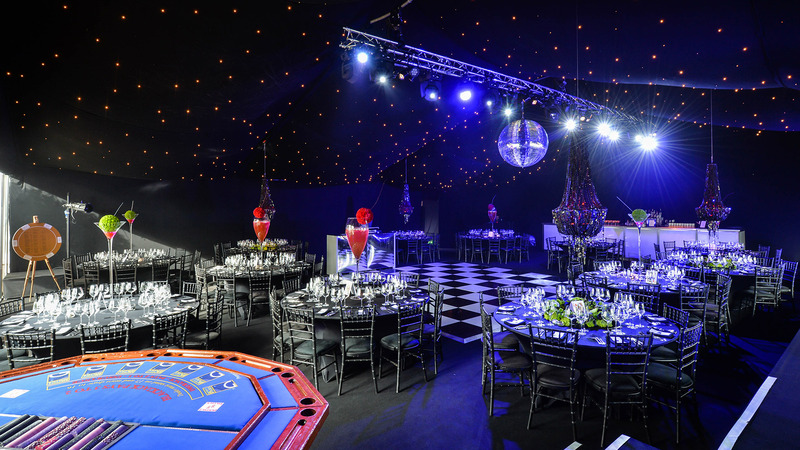 Serve cocktails on trays of dry ice, bring in tarot card readers and fabulous illusionists to keep the guests jumping! –GO AL FRESCO – create a fabulous garden party with drinks on a terrace (large heaters will keep the night chill at bay), fire eaters and entertainment on the lawn, use a marquee dressed with crisp white linens topped with lush garden foliage and flowers for the dinner and finish with a spectacular firework display. Many stately homes and country houses in the UK can offer space for this type of event. –SEE SANTA – why not take the team to Lapland – home of Father Christmas – where you will be met by his elves, stay in log cabins around a lake, enjoy a range of winter sports and also see Santa’s Grotto! –GO TRADITIONAL – hire space in a country house for a traditional Christmas dinner. Carol singers on the lawn, roaring log fires, drinks reception in the library and a traditional 4-course dinner. Make use of a ballroom, or create one, and hire a live band to round off the night. – DANCE FEVER – create the hippest nightclub in town. You can often hire nightclubs or create one in a warehouse space. The key here is to hire the very best New York or London DJs and dancers. Get everyone involved by creating a massive disco-dance class with expert dance tutors. Blow the budget and if there isn’t one already in the venue, build a mezzanine level as a chill-out area that overlooks the dance floor. This will be the coolest Christmas your team has ever had! I hope my Office Christmas Party Ideas have been helpful….but…. … my last tip is to provide the unexpected and whatever you choose, be sure to include a few surprises for the guests. If you are tasked with planning a corporate event for the festive season, or indeed any time of the year, there is much to think about. Not least is how to make the investment in the event pay off – in terms of engaging with your audience, raising your profile and creating a lasting impression. 1. Venue is paramount – location, quality and cost are all important considerations for business planning a corporate event but reputation and delivery also have a very important role to play. Ask a professional events organiser to recommend venues that they know will deliver on the day as this will guarantee your event the best chance of success and reduce risks and of course stress levels for the organisers. 2. Catering is always important – whether you are hosting a breakfast event, a drinks reception with canapés or a full blown gala dinner, invest in the best food and drink you can afford. Great catering is a real talking point and guests will remember a fantastic meal – or even a top notch plate of quality bacon butties – long after the event is over. Also consider that they will also remember bad food for a lot longer – and are even more likely to talk about this! 3. If budgets are tight consider investing in one real ‘wow’ element which will leave your audience with something to remember. This can be the food, spectacular entertainment, a strong or moving corporate video which leaves a lasting impact or perhaps stunning goody bags to create a real feeling of goodwill among guests as they leave. 4. Good planning and communication is vital. Have a communications plan in place which clearly outlines your expectations and strategic objectives for the event, and share this with organisers, the venue and any employees ‘working’ the event. Also consider external communications – make sure guests are clear on where and when the event is, any travel or parking arrangements, accommodation options, the event timetable, seating arrangements etc. Extend your external communications plan further by making sure your marketing and PR team are fully informed and able to maximise any opportunities arising from the event. 5. Evaluation is an essential tool. Any investment should be evaluated against your original strategic objectives and the same can be said for events. So often businesses think that once the ‘party’ is over that’s it and they can sit back and relax before planning their next corporate event. But was it money really well spent? What did your organisers really think about the event and did you achieve your original objectives? What worked well and what was less successful. What did employees working the event think? What can you learn for future events? Spend time talking to organisers, the venue, guests, caterers, entertainers, employees, local or business media – indeed all stakeholders in an event to ensure maximum returns on any future investment and to help manage your corporate reputation. Whether you are planning your events in-house, or using a professional events partner such as TLC, follow this advice and you wont go far wrong. Such a great guy and a joy to work with him a couple of years ago on the inaugural Children in Need dinner in the north west. Some great images from the night on our website, click: PARTY. Good luck with the album Gary. – clear the driveway so people can park easily. Be sure to invite the neighbours and then politely ask if people can also park on their driveway too. – twinkly lights in the front garden trees/bushes creates instant glamour for a reasonable cost. Lights are not just for Christmas. -fresh flowers and scented candles burning in the hallway – try Jo Malone LIME AND BASIL MANDARIN. Don’t forget to light the darker areas of the hall such as under the stairs – it makes such as difference! -music played low in the hallway will give an instant sense of arrival and set the atmosphere. If the budget allows, some entertainment on the driveway is always a talking point! – never let them sign the bell! Always have someone to meet guests as they arrive – a smile is a much better welcome than the door knocker! Then, join your guests and enjoy the party! So if you are visiting your potential venues this weekend – bear in mind my advice – it could help you make the most of the space and your budget! Office Christmas Party Planning can sometimes prove to be a real headache. 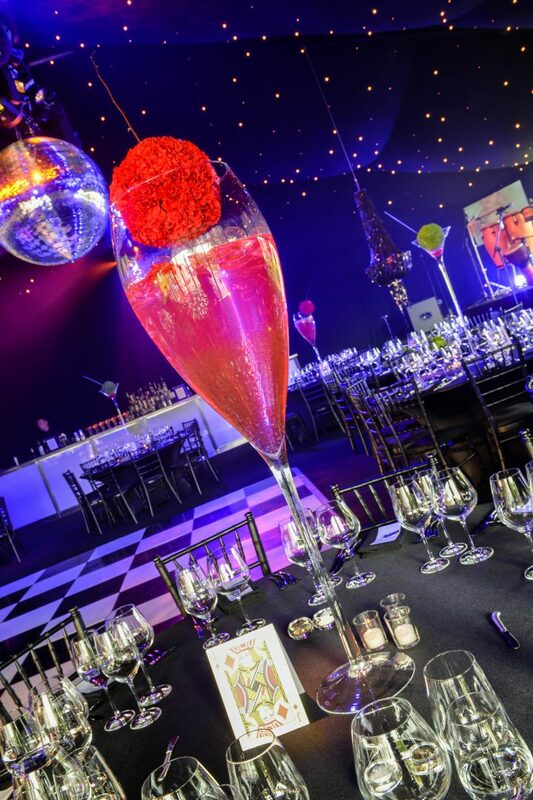 Choosing the right venue, booking the entertainment, ensuring everyone is in the right place at the right time….not to mention making sure the catering is up-to-scratch and injecting a little WOW factor to proceedings. Like no other time of year, all eyes are on the office party at Christmas, so it’s vital to plan early and get it right. Here’s some Office Christmas Party Planning advice from the team at TLC to help you make planning as stress free as possible, and keeping the party on budget without losing the all-important sense of celebration, style and fun! -Understand your budget and gather a team together. It is a lot for one person to take on board, so gather some colleagues together and delegate tasks. Bringing in a professional event planner can be a great investment as the will ease the burden of planning, but also allow you to stretch the budget. A professional planner can also negotiate better deals that you will be able to (we organise hundreds of events so can leverage our buying power with suppliers) – and have direct access to top entertainment and unique venues. -If you haven’t set a date, booked a venue and planned your festive event DO SO NOW – often the best venues are booked out by the end of the summer. If you can’t get your preferred venue, consider holding your party on a less popular day such as a Tuesday or Sunday, or even in January, both options will be less costly, enabling you to get the most out of your budget. -As soon as you have secured your booking, send out a ‘Save The Date’ email to whet everyone’s appetite, stating the date, time and venue. This is not only cost effective but will ensure as many people as possible attend. By following this up with a more detailed, themed invitation, you should get a great response. Always make sure you include an RSVP date and a request for any dietary requirements, as you’ll definitely need this to finalise catering. -Don’t go for obvious venues. They will be the ones that are booked up a year in advance. Consider large function rooms in museums or contemporary galleries, which can often be hired at a reasonable cost. If your budget allows however keep your eyes peeled for more unusual venues. Our clients have partied aboard a branded red London bus, private yachts, zoos, aquariums, to railway arches and urban warehouses. Be creative! If you’re after something a little less quirky but equally impressive, find something that gives your party an added sense of occasion such as a hotel rooftop cocktail party, a Winter Wonderland themed marquee or festivities aboard a traditional steam train. -The trend for buffets, bowl foods and good canapés rather than the formality of a sit-down meal will continue this year. If your venue has the outdoor space, also consider street food carts. They add colour, a sense of theatricality and a great variety of international cuisines including Mexican, Thai and Japanese dishes. Always offer Champagne cocktails – a Kir Royal made with sparkling wine & cassis – or a traditional mulled wine, rather than glasses of Champagne at the reception to trim cost and never forget to offer a non-alcoholic alternative. Staff often expect a free bar at Christmas, so manage this by providing bottled beers and wines at the company’s expense and offer a cash bar for everything else. -As with all of TLC’s events, and Christmas is no exception, I think you should leave guests with a lasting memory of the occasion. Spend budget on one spectacular surprise element, be it fireworks to round off the evening, an ice rink or a visit from Santa and his reindeer. I recently attended an event where a real-time graffiti artist created a bespoke piece of contemporary street art while guests partied. The fantastic artwork was dramatically revealed at the end of the event and created a real stir amongst the guests. -Rather than providing goody bags for your guests, consider hiring a photographer, or better still a photo-booth! Booths come in weird and wonderful guises now, such as converted VW Beetles, complete with comedy hats, glasses and props. Everyone has great fun dressing up and comes away with a unique memento of their fantastic evening that (hopefully!) they’ll be able to display on their desk and talk about for months to come. I hope these Office Christmas Party Planning tips have helped – just one final thing to remember – enjoy the party! !